100% ecofriendly, handmade product from bamboo. It is galvanized metal with Bamboo shoot. 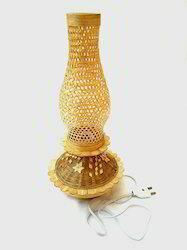 Lantern made of bamboo provided with electrical fittings. Taken from an ancient style of design, this bamboo lantern, cast in alabastrite, is carefully painted with an everlasting Buddha motif.